Boulder City High School boys basketball team won the Lake Mead Holiday Classic championship over the weekend, defeating rival Moapa Valley 70-50 in the title game. 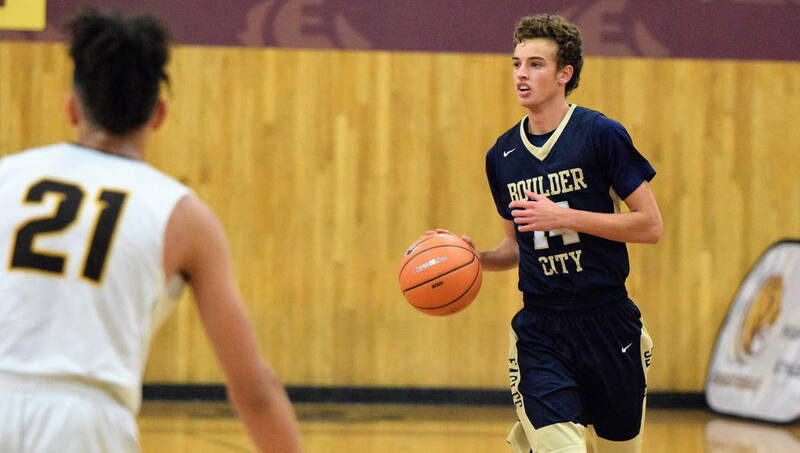 (Robert Vendettoli/Boulder City Review) Senior guard Karson Bailey of Boulder City High School brings the ball up court against Bonanza on Monday, Dec. 3, 2018. During weekend play in the Lake Mead Holiday Classic, Bailey scored 81 points and was named MVP after the Eagles won the tourney title. 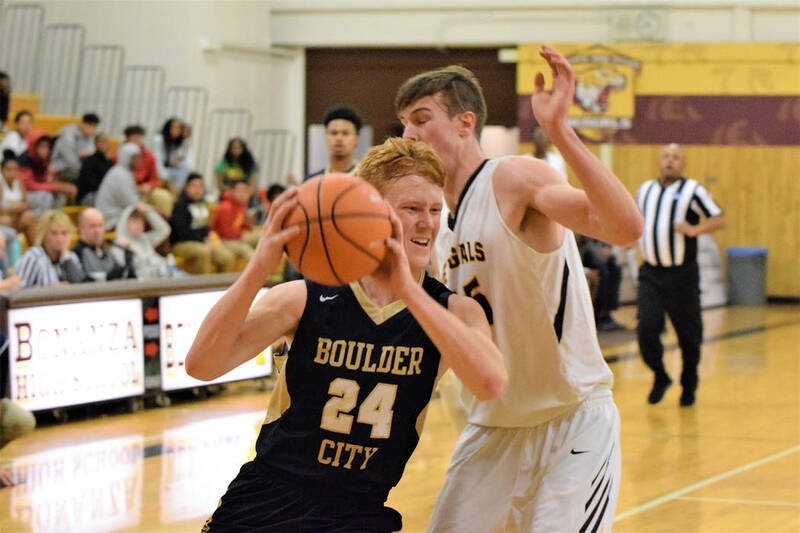 (Robert Vendettoli/Boulder City Review) Boulder City High School sophomore forward Matt Morton powers his way inside for a layup against Bonanza on Monday, Dec. 3. The Eagles won 59-57. The Eagles (6-0) are expected to be one of the favorites in the 3A classification this season and are playing up to their lofty expectations. Not only going undefeated throughout tournament play, but winning effectively, the Eagles routed The Meadows 57-26 along with their 20-point victory over the Pirates and win against West Wendover 78-63. Their closest game of the tournament came against American Prep in a 72-64 victory. Playing the best stretch of basketball of his varsity career with the Eagles, Bailey was named tournament MVP for his efforts. The focal point of the Eagles’ offense, Bailey scored 81 points during the four-game stretch. He and senior Derrick Thomas were named to the All-Tournament team. Playing solid offensively as well, Thomas scored 19 points against both West Wendover and Moapa Valley and 13 points against both The Meadows and American Prep. Sophomore Matt Morton scored 21 points against American Prep and 15 points against West Wendover. Sophomore Ethan Speaker added 15 points against The Meadows, 14 points against West Wendover and 13 points against Moapa Valley. Keeping their winning streak alive to open the season, the Eagles battled down to the final seconds with 4A Bonanza on Monday, Dec. 3, walking away with a 59-57 victory. Thomas and Speaker each scored 13 points, while Bailey and Morton each had 12 points for the Eagles to remain undefeated. The Eagles will face their stiffest competition of the season Friday, Dec. 7, when they host 4A Foothill. They’ll also host SLAM Academy on Monday, Dec. 10 before traveling to 4A Green Valley on Wednesday, Dec. 12.